I recently attended a conference in Singapore called Learning Roundtable which was essentially how to effectively use iPads in classrooms and schools. One of the most interesting workshops was by John Wolfe and using QR codes as learning tools. I really liked it as I could immediately see the educational value of QR codes as it helps link the real world to the digital world and also takes advantage of mobile devices. I had seen QR codes around but really didn’t understand what they were or how they were being used. QR codes are a lot like bar codes that on food products. The difference is that they use both horizontal and vertical lines of axis so can hold much more information. By using a QR reader on your phone, you can scan it and it takes you to a digital link. What possible educational value do they hold? Literacy-There are ton of possibilities. John Wolfe mentioned a few ideas on his site but one effective way that he had used them was he had students create 60 second book talks using Photobooth, created a QR code for it and then printed out the code and put it on the inside of the cover of books. What a fantastic way to link print to digital media! PE-I thought there would be lots of possibilities if you already have iPod touches in your school as you can download a free QR reader and you could use it in PE for orienteering. Have students find the codes around a field which give you clues and directions to the next location. Social Studies/Humanities- For field trips, students could go to actual locations and using mobile devices, they could record a video or text about what they learned about particular works of art. Then, create QR codes to link this information for other students. Math- John mentioned that he has seen teachers create QR codes which link to online videos for Math textbooks. What a fantastic way of making textbooks more engaging! 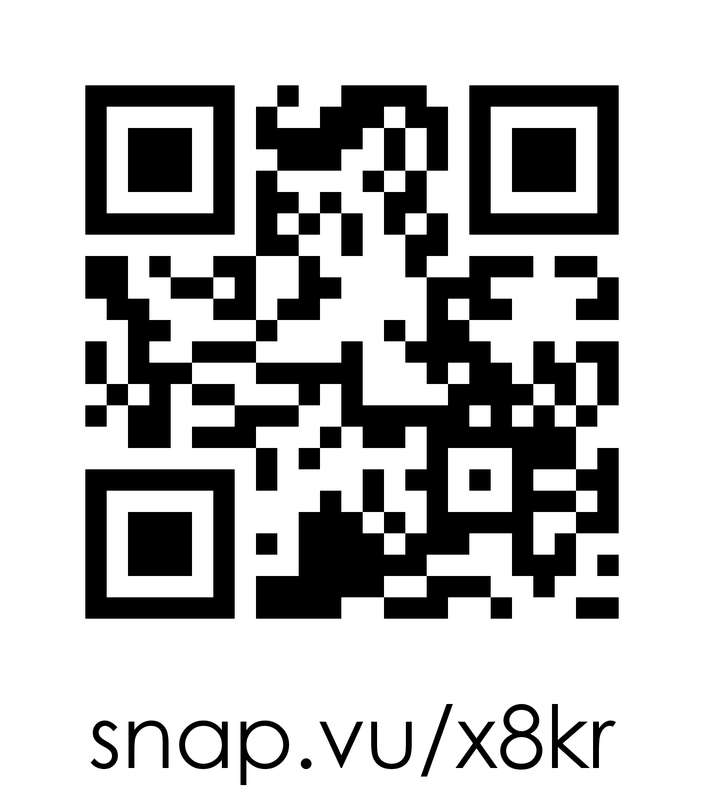 If you would like to start creating your own QR codes, you can set up a free account on Snap Vu which allows you to edit the content but maintain the same code (so you don’t have to keep printing out new codes). It also tracks how many people have actually used your code. The one little glitch is that when you put in your URL sites, make sure they are already shortened by a site like bit.ly as I tried to copy and paste a long URL from my google site (see above) and it didn’t work. Are you using QR codes? Leave a comment with your idea! I recently watched Randy Pausch’s Last Lecture on TED and really got me thinking about learning. First of all, if you haven’t watched it, sit down and grab a coffee and get comfortable on your couch for a really interesting presentation. It is very heart-warming from beginning to end as he talks about his life lessons knowing that he has terminal pancreatic cancer and has 3-6 months to live. It isn’t depressing at all however. One of his ideas is “Head Fake Learning” and how vital it is to learning and teaching. He calls head fake learning the deeper and big learning that you learn (sometimes disguised) while learning something else. For example, learning teamwork skills and cooperation from playing saturday morning soccer. I guess I have always been a big proponent of this type of learning as I got into teaching by studying Outdoor and Experiential learning and working at summer camps and Outward Bound. I truly believe that we all should have a head fake learning that should be part of everything that we do. These can be big attitude skills such as perseverance and caring or thinking skills like problem-solving skills or reasoning skills. They don’t always have to be big skills but they should be important. This is the type of learning that happens and slips through the cracks of curriculum but stays with students for life. All too often I see teachers who struggle to teach effective technology lessons. Really, an effective technology lesson should mirror an effective teaching lesson but with a few changes. Just like any lesson, you should start with the end in mind. What is the big ideas and smaller outcomes? Keep it specific and too the point. Make sure that it connects with the rest of the curriculum. Long gone are the days of teaching specific skills out of context such as how to format a paragraph (unless you are teaching it in a writing context). In other words, don’t teach technology skills in isolation. I usually think about a project that I want students to work on and then break it up into smaller mini-lessons that will key on some specific skills. 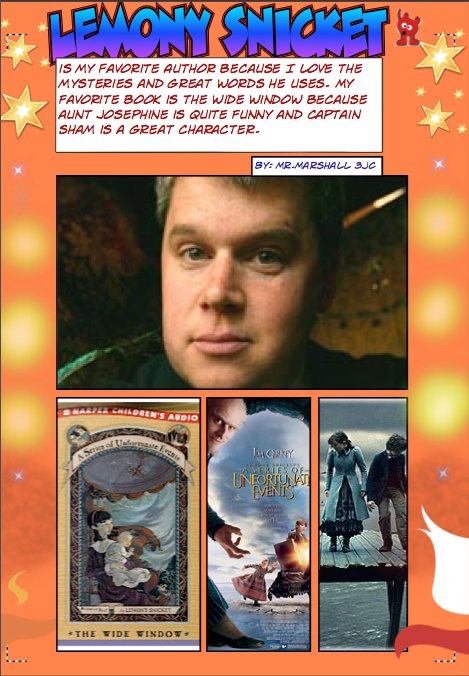 For example, one project I did last year with the Grade 3s was designing a Favorite Author poster using Comic Life. I knew that most students hadn’t used this program before. So first I created a sample product on my own. I can’t stress how important this step is. By creating a project of your own, it allows you to see all the steps involved, work out any bugs or potential issues, and see it from a kid’s point of view. If you have already done this before, then no need to do it again unless there have been some significant updates to the program. This step is also important because you want to give a sample that students can work towards. This obviously motivates them and gives them a clear end in mind. You need to hook students in somehow. Start with a story like, “I was reading this book the other day by Lemony Snicket and I realized how much I enjoyed all his books. 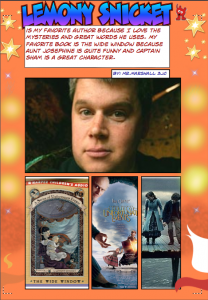 I decided that I wanted to create a poster to show other people why I like him and promote his books”. Make sure you have a good visual on your SMART board or projector at this point. Then give the challenge to students. Explain the goal and why they are doing the project. Do a “walk-through” of how to create a new one, breaking them down into no more than 5 steps. Review the steps (or have students tell the steps back to you). Sometimes if it isn’t the first time, I let the students who can tell me or show me the steps back go first to the computer as a bit of a reward (just make sure they still listen to the remaining steps). I also like to show a couple of advanced tools and say, “Hmmm…I wonder what this tool does. That would be really cool if someone could discover what it does” This allows for a bit of differentiation and motivates students for extension. I usually go over a checklist or assessment rubric just before they go as well. I like to spend 3-5 minutes at the end of the lesson to wrap it up. This actually is an often overlooked step but essential for meta-cognition processing. Allowing a few minutes to share what they made (show their work if possible) or explain some discoveries of some new features is very important. Always try and make time for this. So that’s it in a nut-shell. It really just comes down to good teaching practices. It really is a special blend of art and science. The art is in the delivery and the science is the formula and preparation. But if you are unfamiliar with a program or project, you really need to explore it yourself first. Test all electronics out before the kids are there (projectors, cables, etc) so that you don’t have any technical problems along the way. Good Luck!